Are you looking for church resources? If yes, you are in the right place! 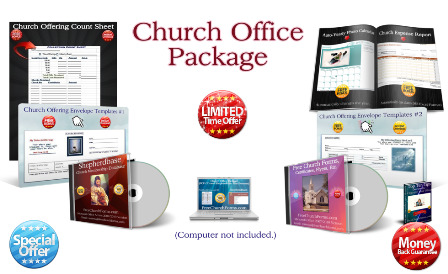 Here you will find 900+ Free Church Forms, Letters, Certificates, Flyers, Brochures, Cards, Games... to download, customize and print absolutely free along with many other valuable free gifts! 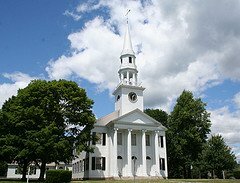 Free church forms are not always easy to find on the web so I was inspired to build this website to try and make it a little easier for churches to find forms for all areas of their church. The free forms, certificates, flyers...are available 24 hours a day 365 days a year with immediate access. It's easy and free - just find the form you want and download it! Do you need an affordable, user friendly church membership database? If yes, click Shepherdbase on left Navigation bar (top left side of your screen), and if you need an affordable, user friendly event tracking database for your Pastor and/or church then click Pastoral Recordbase on left Navigation bar. Click the link below to translate any of these forms, letters, etc. from English to Spanish and more. Haga clic en el enlace de abajo para traducir cualquiera de estas formas, letras, etc. de Inglés a Español y más. Translate forms, letters, etc. from English to Spanish and more. So it is a time to celebrate. 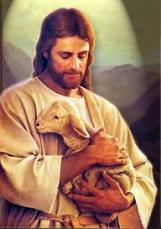 To celebrate that our Lord, who appeared on Earth for the good of mankind, is always with us. Do you need Easter Invitations for your Worship Service or any other forms for the service or Sunday School classes? Click here to access the free Easter Brochures, Cards, Crafts, Forms, Ideas, Activities and Much More to download and print at your convenience 24 hours a day 7 days a week. I love to find free stuff on the internet as long as it's not bait to rip me off. You don't have to worry about this website. There is no hidden cost, free trial period, or "collecting all your information so I can sell to the highest bidder" cost. I created (Shepherdbase) so even small churches could afford to have a way to track their memberships, contributions, attendance and much more! You can purchase Shepherdbase On Sale Right Now through April 30th, 2019 By High Demand for ONLY $29.99 (One Time Fee with Free Lifetime Upgrades) - $5.00 Savings! As a Bonus and Thank You for purchasing Shepherdbase you will receive two free gifts (Offering Envelope Templates & Offering Count Sheets) - Hurry and Enjoy These Savings and Benefits! Track church member's information with a very nice Church Membership Directory (name, address, phone, email address, date of birth, member's pictures, anniversary, etc.) with unlimited memberships and Free Lifetime Shepherdbase Updates. Track church member's contributions and automate Annual Contribution Letters. Filter church member's information with the click of a button (birthday and anniversary monthly reports, member's name and phone number), and so much more. 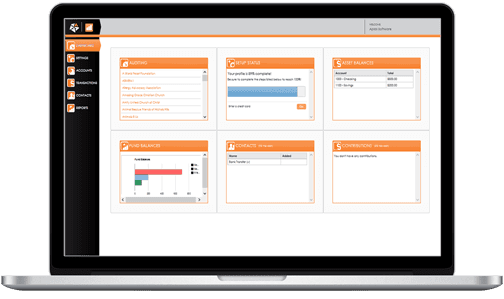 Track Church Attendance with quick access to attendance reports. Shepherdbase is a very simple and user friendly database, but very powerful with a 100% Satisfaction Guaranteed. This database is simple and user friendly. Many churches have volunteers but they can easily use Pastoral Recordbase with ease. I created (Pastoral Recordbase) so even small churches and/or Pastors could afford to have a way to track their sermons and their events such as baby dedications, baptisms, funerals, weddings, etc.! You can purchase Pastoral Recordbase On Sale Right Now through April 30th, 2019 By High Demand for ONLY $19.99 - $5.00 Savings! (One Time Fee with Free Lifetime Upgrades) As a Bonus and Thank You for purchasing the Pastoral Recordbase you will receive free gifts/bonuses (Event Certificate Templates (4) & Event Planning Tracker in MS Excel) - Hurry and Enjoy These Savings and Benefits! Track Events (baby dedications, baptisms, funerals, weddings and any type of event). Also, attached are certificates, documents, and reports to print with these events with unlimited event records and Free Lifetime Pastoral Recordbase Updates. Track Sermons (Pastor's or any other sermons). Also, attached are sermon notes, documents, and reports to print if needed. Track Phone Numbers (Pastor's phone book to include ministers, etc.). Also, attachments and reports to print if needed. Pastoral Recordbase is a very simple and user friendly database, but very powerful with a 100% Satisfaction Guaranteed. Click Here for More Information on Pastoral Recordbase. 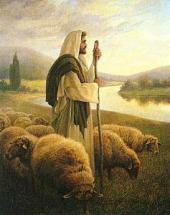 Do you ever feel overwhelmed, stressed and maybe at a lost over your church finances and/or church accounting? If so, you're not alone and don't worry I have the solution right here in this book - "The How-To Guide for Small & Growing Churches" Paperback Book! This website is very easy to use as well as informative, and will save you and your very precious church time and money. FreeChurchForms.com has free church forms, letters, certificates, flyers, brochures and so much more that has been created to help small churches or churches of any size or denomination to be able to download, modify and print professional and attractive forms, flyers, beautiful church certificates, cards, brochures, games...and even a free eBook - "Top Ten Tips on How to Organize Your Office"! Important: The free church forms, agreements, contracts, etc. that you have searched online and received free or the ones that you paid for can never replace the advice of a lawyer. Each individual state has different circumstances and laws that apply to different types of churches and organizations. We strongly recommend that you have your church forms especially legal agreements or contracts, reviewed by a lawyer in your state for any questions or legalities for your own individual church. These sample forms on FreeChurchForms.com are meant to serve as example forms and should not be construed as legal documents. Please contact a legal professional for legal language for your specific state and organization. I'm continually creating more free church forms, certificates, flyers...to download so subscribe to this site via the RSS feed below nav bar on left! If you have a small church or non-profit organization that depends on volunteers or you have frequent turnovers then it is very important for you to have an accounting system set up that is simple to use and easy to learn. FreeChurchForms.com readers will receive a special discount of 30% Off for 12 Months simply by entering the Promo Code: FCF12 in the promotion code box! 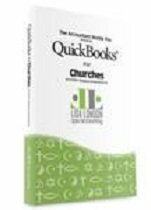 If yes, then the "QuickBooks® for Churches and Other Religious Organizations" by Lisa London, CPA</a> eBook below is a must for you! Imagine understanding how to use QuickBooks for your nonprofit. You CAN master those dreaded accounting tasks because of the step-by-step instructions. Classes are available now. No Nightmare, No Stress. Just step-by-step instructions on setting up and using QuickBooks Online. Lisa London, CPA is the perfect instructor for these QuickBooks classes. You ask why? Because I personally know this lady who is a friend of mine and she is the perfect instructor for these classes! 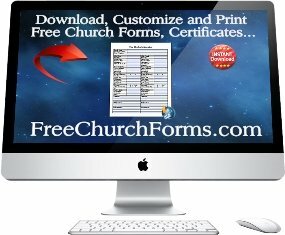 I have the FreeChurchForms.com Table of Contents available with all the free church forms, letters, certificates, flyers...by categories. You can just click on the church form you need and it will bring you directly to the page to download. You can access the Table of Contents by simply signing up for my Free Monthly Newsletter (top right hand corner of screen). There are no hidden costs. 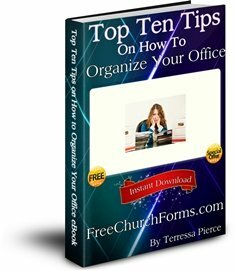 You will just have access to lots of great church information, new church forms, certificates, flyers, brochures, sample policies and procedures... and you will also have access to my free 14 page eBook - "Top Ten Tips on How to Organize Your Office" as a Thank You Gift for signing up. Just simply enter your email address in the small form in the top right corner of screen and subscribe to the "The Form Gallery" and you will be able to access the FreeChurchForms.com Table of Contents immediately in any back issue, and receive the free eBook today also. My name is Terressa Pierce. I work a full time job (home business). I'm also the secretary for my church. I've been the Church Secretary for 22+ years now, and I really enjoy the ministry God has given me even though it has been very stressful at times. I've worked as a secretary in many different fields for most of my life (37+ years), and I know how stressful this job can be at times. I love to create different types of forms that can save me and other people in the office lots of time and stress. I just want to be able to share my work and save God's precious, hard working, loving people some time and stress out of their busy schedules in their ministries. We have a Wonderful Church Financial Adviser at our church who has inspired me to do this website. She has a website where she gives away free church accounting spreadsheets and lots more. Before she was elected our Financial Adviser I was literally pulling every one of my hairs out trying to keep up with our accounting on a paper ledger. She created a simple accounting software just for me and made my life sooooooo much easier. She has been able to share her accounting spreadsheets with all kinds of wonderful people all over the world. We have a small nonprofit church and we're not able to just go buy the software we need. She has made my life easier and she can make yours easier also. You will be glad you did. I will be referring visitors to her website for free church accounting financial spreadsheets, and nonprofit accounting information. She also has all kinds of free church accounting information you need to know regarding church tax laws, etc. that you would have to pay for from any other site. Please feel free to visit her website at FreeChurchAccounting.com. I found a wonderful company called "Solo Build It" (Site Build It was their former name) to build my website when I was looking online. It is a great company to start your first website! They can help even the most inexperienced novice (like me) build a website. They have many wonderful tools to help you every step of the way and they even take care of the maintenance on it. I had absolutely no experience whatsoever when I built my website. They have step by step guides, and they also have a wonderful forum help to share information and get expert advice. It is also very affordable considering everything they have to offer. I have been successful with the help of SBI because they give you the opportunity to build traffic with the best of tools available and forums! If you're interested in building your own website click on the banner below. You will find out everything you need to know on how to build your own site. It is very rewarding when you are able to help so many people. All the church forms, letters, flyers, baby shower invitations/games, beautiful church certificates, crafts, brochures, cards, gift certificates, etc. are easy to download and they are absolutely free. Feel free to download what you need at your convenience 24/7. Feel free to search my site for whatever needs you might have. Also, please sign up for my free newsletter to keep up-to-date on my new free church forms, certificates, flyers...and also receive great information on church-related issues and forms. Please contact me with any questions or concerns you might have. I really appreciate and enjoy the sweet sincere emails thanking me for this website and for all the hard work I have done to help other churches including their own church. You can find some these emails on the right hand side of the screen. I also enjoy meeting people from all over the world!